In this project modules under study are Material Issues module, Reports module.requisitions and Inter stores issues i.e. 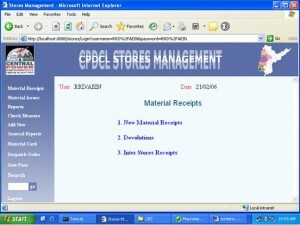 material issues to other stores based on inter store requisitions. For these two operations, we have to issue the gate passes for both types of operations. (Andhra Pradesh Central Power Distribution Company Limited) atAPTRANSCO. 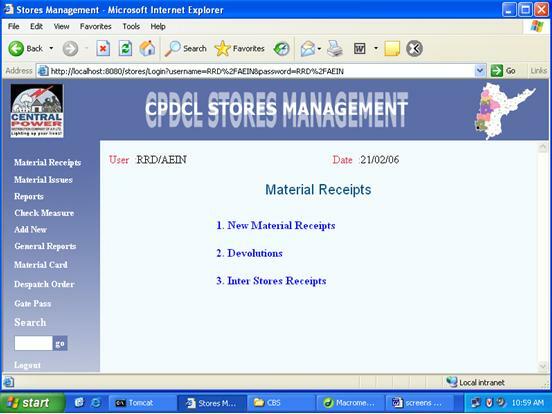 Earlier the materials of stores have only been automated. In our project “STORES MANAGEMENT SYSTEM ” we have automated the stores of the central power distribution company limited. In Issues module, we have tracked the information regarding the issues of the receipts for the material that have been stored in the stores of the central power distribution company limited at CPDCL. This information can be easily made available to all the stores throughout the AP through intranet/ Internet. As a result of this automation, manual workload is reduced and data retrieval becomes easy. This project can be helpful for centralization of information regarding the stores of APCPDCL at APTRANSCO.